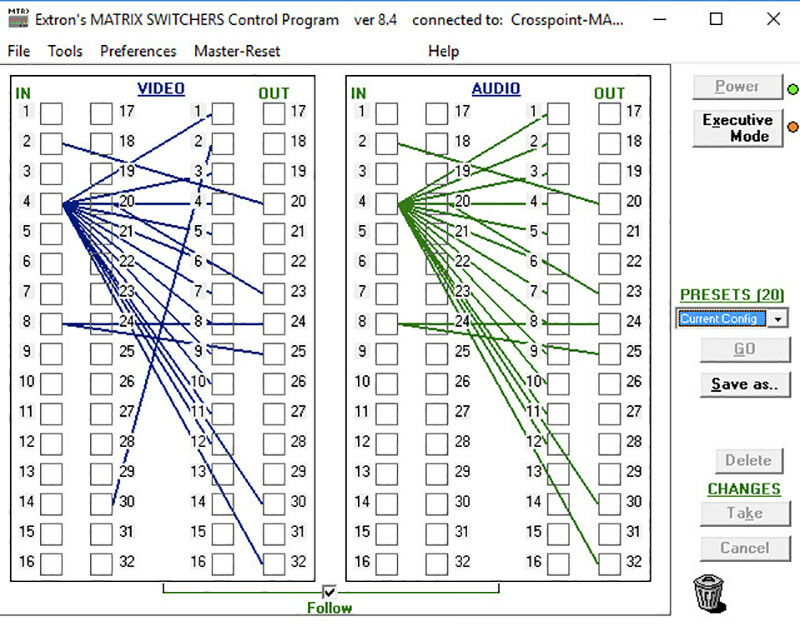 For almost two years now I've been trying to figure out a way to control my Extron Crosspoint matrix switcher through a touchscreen device of some type. 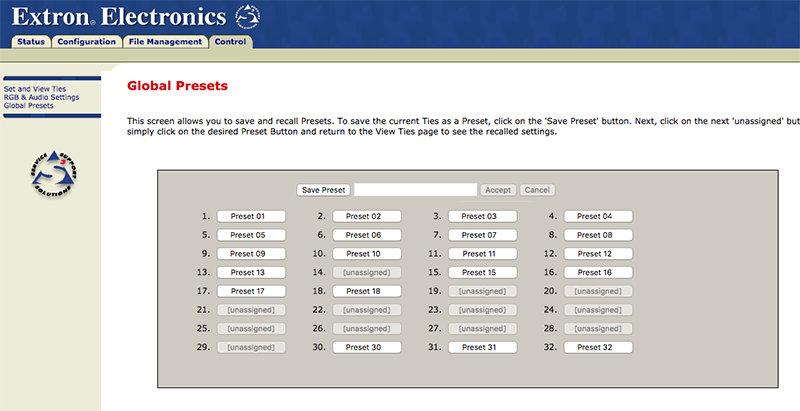 It's not that it's hard to load a preset or anything (which is simply pressing "Preset + Preset Number + Enter" on the control panel buttons), but it's that I've always liked nice looking GUI's (graphical user interfaces) and when you have a switcher which was well over $30,000 about 15 years ago, it would be nice to control it with something similarly impressive. At that point I stole the HTML code from the Extron Preset control webpage, and built a HTML webpage with nice per-console graphics (based off the label artwork I made for the physical back-lit buttons of the Crosspoint), and now you can click on each console's logo and it'll load that preset (the presets I already manually setup on the Crosspoint, although you can make those through the software or web interface as well I believe). The Extron Crosspoint houses all the HTML files and acts as a server of sorts for those. The Crosspoint does need to be hard-wired/connected via Ethernet cable to the same network your tablet or phone is connected to (i.e. your home network). You can do this by running an Ethernet cable to it from your router, or you can even link a laptop to share it's internet connection with another device, or use a wireless ethernet dongle or one of those WiFi range extenders with Ethernet port or whatnot. I did need a USB to Serial programmer cable to be able to turn on HDCP (which was the only way I could connect to it via Ethernet and my network). Please note not all Extron Crosspoints are network capable - please read the manual of your specific model to find out if yours can be controlled this way. So that's about it. Next steps are to tweak the webpage I made so it fills the screen properly (currently have to zoom manually a little bit), see if there's a web browser for my iPad 2 (might use an ancient Android Nexus 7 I have as well) which can go full-screen without the navigation bar on top, and I want to get a flexible arm mount for the tablet so I can mount it to my desk so it's secure and easier to use for switching. Last edited by Dochartaigh on Sun Sep 23, 2018 10:01 pm, edited 5 times in total. Post subject: Re: Control Extron Crosspoint switcher with a Touchscreen! I don't know how many people have access to Adobe InDesign and Photoshop, but the InDesign document has the layout for the table with all the graphics inserted (which you can then edit with whichever graphics/logos/buttons you want). 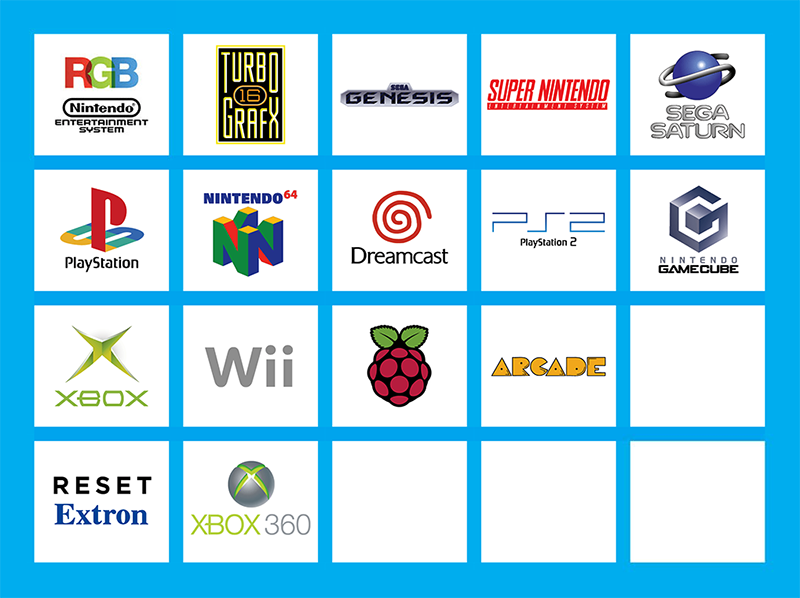 The Photoshop file (which many more people use Photoshop at least) has guidelines setup for each graphic block, and it's then pre-sliced and named for each console. 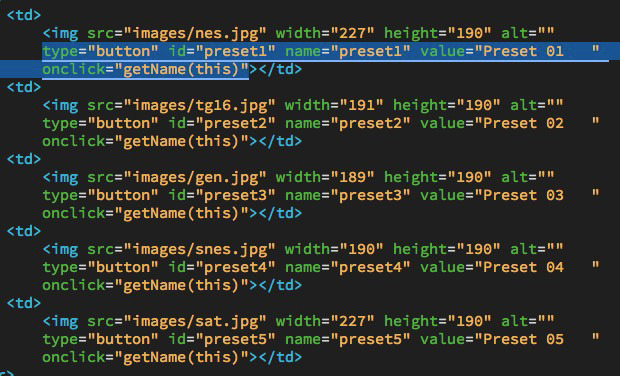 All you have to do to generate a HTML file is go to File > Save for Web, and choose "HTML and Images" on export and it'll automatically create a split-up table with all the HTML code. For non-Adobe people (maybe using Gimp - a popular free Photoshop like program), I've included a huge 3000x2000 pixel high-res JPG as well (or just make your own graphic! I know people don't have the same exact systems as me so this will probably have to be done regardless). All of these graphics are setup to run perfectly on the default Safari browser on an older iPad 2 with its 1024x768 pixel display (minus header bar). You'll have to do some scaling and centering to get it to display all on one page without scrolling on another browser or device (or build it with more advanced HTML/CSS/etc. which automatically scales to whichever display it's on). type="button" id="preset1" name="preset1" value="Preset 01 " onclick="getName(this)"
to your image tags as shown, and replace the numbers (please note the preset number is in that chunk of code THREE different times, so you need to change each of those every time) for whichever preset you want to load. Upload your HTML file via the Extron File Management tab (along with all the graphics), browse to the address you're Crosspoint is on and it should work. Last edited by Dochartaigh on Tue Sep 11, 2018 6:00 pm, edited 4 times in total. Nice work! How much time would this save compared to pushing the buttons normally? I mean....you're pushing 1 virtual button, versus 3 real buttons on the device itself, in order to load a preset (which the preset has to be setup beforehand like I mentioned)... but this really isn't about that. It's about having a nice modern interface with your 1980-2000ish-era deluxe gaming setup...and it doesn't hurt that the interface (to my eyes at least) is very pleasant looking. To the thought of saving time though, I did have to mount my huge crosspoint pretty high in my server rack so I do have to physically get up now to switch consoles...but I swear that laziness had nothing to do with my motivation to get this working . Also, they invented the remote control all those decades ago for this same purpose (so you didn't have to get up to change the channel or volume) - all this is just a fancy remote control for the Crosspoint. any possibility of having a pc version of this software available? its my main go-to for custom stuff like this. really ? You were able to replace the html stuff on the Extron itself ? I would have expected these to by write protected in one form or another. And I would second the request for a copy of the software. This is REALLY nice work and I'm sure plenty of users here would appreciate it. PC is perfectly fine. In fact any device which can view a web page will work for this - that device just has to be on the same network the Crosspoint is plugged into. Yes, the Extron houses all the files. They do not overwrite the stock files (which I don't think you could delete even if you tried). The default IP address is 192.168.254.254 I believe. 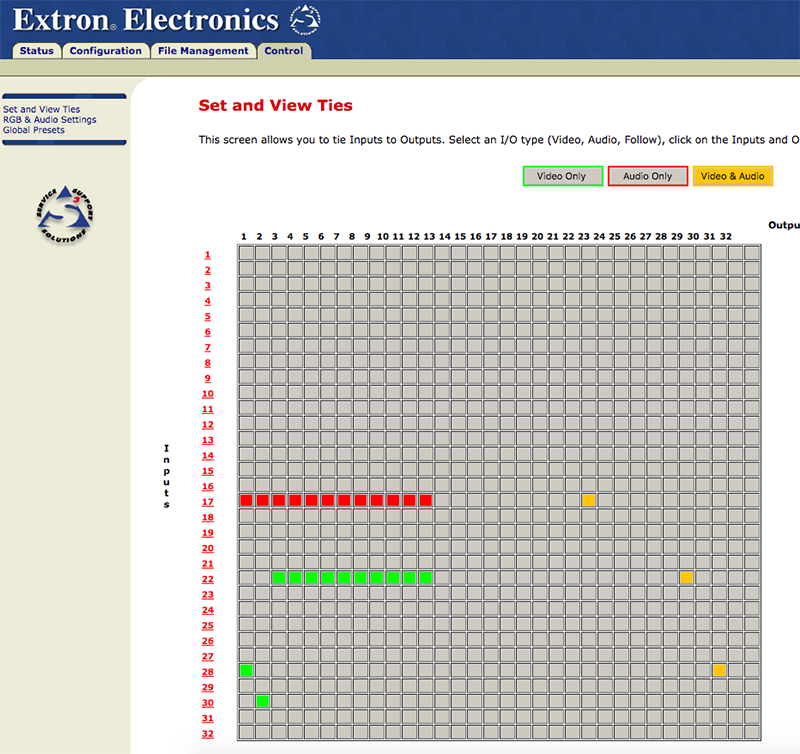 If you go to that it'll automatically load the Extron webpages to do things like control/setup/admin the Crosspoint. What you do is go to the File Management tab, and from here you can upload your own files (individually one-at-a-time...which is kinda annoying but a small price to pay to get this to work!). You can name the files you upload whatever you want. I named mine "control.html", so I have a bookmark on my iPad's browser set to got to "http://192.168.254.254/contol.html". You can even name your HTML file "index.html", then when you go to the root 192.168.254.254 address it'll automatically load your control panel you built. If you then wanted to get back to the Extron's built-in/default web pages you would need to navigate to "nortxe_index.html” (if I'm reading the manual correctly), OR, delete your index.html file and it'll again go directly to Extron's default page again. These things are kinda crazy for their time - you can even setup email alerts to different people when a certain exception or fault occurs on the Crosspoint! (like notify maintenance or the A/V setup people if a connection can't be made, or if a redundant power supply kicked in on, or a cooling fan died on a certain unit or whatnot). Oh, and server space on the Extron is very limited BTW. I think it has something measly like 1.3mb of space (don't think I misplaced a comma there either - think it's a little over a single megabyte). My entire control panel is 196KB though including all images - so plenty of space for even a much more complicated version which I'm currently working on. See above – I uploaded my working files. People can also PM me for other needed items... Extron is really bitchy about non-professional people having access to their portal site so you can't just download their Windows control software. People who can't connect to their Crosspoint via ethernet may need that Windows control software (like I talked about above in my initial post: i.e. having to connect to it via Serial cable first, then turn the option on to allow regular ethernet connection). Last edited by Dochartaigh on Wed Sep 12, 2018 2:35 am, edited 1 time in total. I may be misremembering, but I believe my CrossPoint Ultra 88 used DHCP upon factory reset when I bought it; so I don't think it's that complicated to get your mods up and running. The worst part would be having to reconfigure your presets, which is arguably easier with the web UI, or perhaps getting the switcher's IP from the DHCP lease list on your router. Maybe different models act differently - I really don't know. I just know I've had three of these Crosspoints (Ultra 128 HVA, Ultra 1616 HVA, and this 450 Plus) and the very first thing I do when I get them is go through the ~3-5 different levels of resetting them the manual talks about. This 450 Plus, and at least one of the Ultra's (forget which I tried) wouldn't connect via Ethernet at first, and I was logged into my router at the time looking for any new connections popping up. Extron is really bitchy about non-professional people having access to their portal site so you can't just download their Windows control software. People who can't connect to their Crosspoint via ethernet may need that Windows control software (like I talked about above in my initial post: i.e. having to connect to it via Serial cable first, then turn the option on to allow regular ethernet connection). All I did was explain that I was a hobbyist, and just wanted access to the software for the equipment I owned and they allowed my account sign up through. They don't seem to like gmail or similar addresses, though. Crestron on the other hand, they're extremely protective of their software, I haven't had nearly the same luck in trying to re purpose their older equipment, at least until recently. Do the crosspoint 450s require using the extron SIS commandset? I've been playing with a similar idea for the two 300 series switchers that I own, which don't have ethernet. If you're able to host stuff on the switchers themselves, I imagine it's not as big of an issue as I've been having. All I did was explain that I was a hobbyist, and just wanted access to the software for the equipment I owned and they allowed my account sign up through. You're lucky. I've tried the same on 3 or 4 occasions, with gmail, my CRT website, and my work (fortune 100 company) email address and they denied me every time. Thankfully though, I have a big long email chain with one local rep there who sends me files via FTP when I request something. I tried this maybe 1.5 years ago so maybe they're nicer about it now? They use SIS, yes. 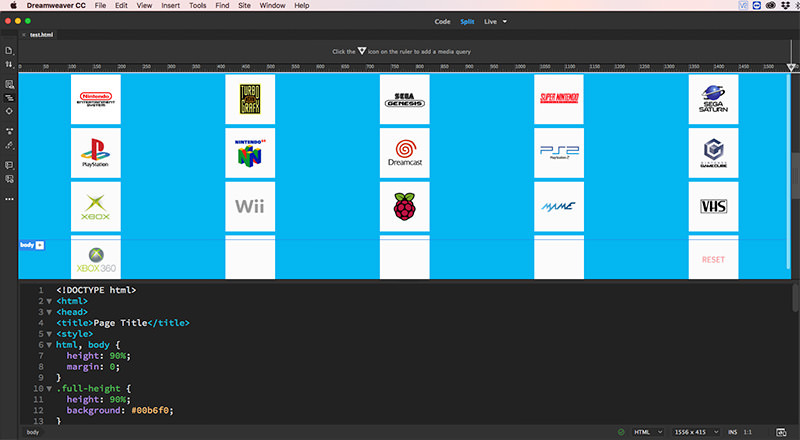 I didn't have to deal with that however - there's a page on the stock HTML login portal (also hosted on the Crosspoint itself), which had all the code pre-written for switching presets, so I simply stole that and integrated it into my HTML file which is how I was (much more easily) able to do this. The next thing I want to try is a guy on Reddit told me about how you can integrate SIS commands into a URL link itself, which opens up all sorts of possibilities on what we can do with this touchscreen control web page (i.e. you're not stuck with ONLY being able to load presets...in theory at least). On another note: do we have any web designers who wouldn't mind working on a little HTML/CSS for/with me? 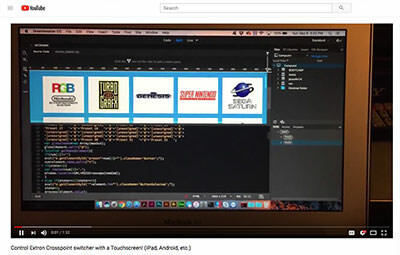 I'm so rusty at coding...and I'm trying to make my HTML template (basically a 5x4 table) responsive so it automatically fits the size (and is centered all on one screen) of the tablet or phone screen (in landscape or portrait orientation) which people are going to use this on. You would get full credit on this tutorial of course (which was just featured in the weekly RetroRGB podcast - so you can be quasi-CRT-world famous! Yeah, Extron treated me the same way and didn't want to give me access to the software. I ended up contacting I'm guess what is one of their third party dealers who ended up selling me the pheonix connectors and also pheonix adapters and he was willing to give me the software but he didn't follow through. I'll have to eventually follow that up when I get around to it unless someone is willing to post it here on the forums. The next thing I want to try is a guy on Reddit told me about how you can integrate SIS commands into a URL link itself, which opens up all sorts of possibilities on what we can do with this touchscreen control web page (i.e. you're not stuck with ONLY being able to load presets...in theory at least). I want to start off by saying thank you for posting your work online for others to use. I'll have to get around to play testing with what you have created thus far. This was the one feature I had wish the Extron had so it's amazing to have someone in the community on working on a solution. So with the ability to integrate SIS commands would it be possible to not only select presets but also to select input and output for video and audio together/ separately with out it being a preset? Essentially giving that exact functionality of the Extron Crosspoint to a internet capable device? I did have a similar problem, they wouldn't let me sign up with gmail, but my work address (software development company) plus the above information convinced them. This was in June, so it's possible things have changed. The SIS command set does let you do a crazy amount, such as controlling volume if you use the switcher for audio, lets you give everything a roughly even volume to remove the need to adjust whatever audio system you have on the output. I've been toying with them with the intention of creating a serial to IR bridge to let me use my logitech harmony. I'd imagine there's ways of doing the same over ethernet/wi-fi with the 450 series. You can even change the RGB levels with SIS - tons of stuff (which I'll probably never find a need to mess with, but it's there at least). You probably already know this, but you can monitor the temperature and individual speed of the fans through the web interface and also by issuing SIS commands. I don't believe that there is a command to alter the speed of the fans however. I ended up making a few loom adaptors so that I didn't have to cut any cables and replaced the Extron fans with Noctua fans and it is near silent now. The original fans are too loud for my liking. If I ever do a complete re-wire (talking literally 20 hours, no joke), I will definitely do that. And it definitely tells you a lot - tells me my power supply and backup power supply are good, all the voltages, temp (at 33 celcius/91F now after been running for around 4 hours), tons of stuff. This is really awesome! I just upgraded from a 12x8 to a 32x16 Crosspoint, and I will definitely be setting this up on mine. I also have an Extron MPS 112 Media Switcher which does 4 VGA in to 1 VGA switching that is connected to an Extron 203Rxi which outputs to the Crosspoint. The same MPS 112 also does 4 S-Video in to 1 S-Video switching that goes to the Crosspoint (in the future it will goto an extron cd400 before the Crosspoint so that I don’t ever have to change video sources on my CRT - waiting for a good $$$ deal). It would be great aid I could find a way to make this switch play nice with the same software and work in conjunction but this one only has RS-232 control so I don’t know if it would be feasible. It would be awesome if the Crosspoint could connect to the MPs112 Serial-to-Serial and that would give the Crosspoint the ability to control the MPS112 over IPLink. I would just run everything through the Crosspoint on a loop back setup but I currently have 24 sources with more on the way and the loop back setup would make me run out of ports again (crazy I know it’s a freaking 32 input switch). Anyway thanks for your awesome contribution. It would be great aid I could find a way to make this switch play nice with the same software and work in conjunction but this one only has RS-232 control so I don’t know if it would be feasible. It would be awesome if the Crosspoint could connect to the MPs112 Serial-to-Serial and that would give the Crosspoint the ability to control the MPS112 over IPLink. Unfortunately, since your MPS is serial-only, you'd have to have something like a RasPi running a webserver that could translate those commands from HTTP calls to whatever your MPS needs over serial. So, it's feasible; it'll just be a bit of work. It looks cool! I just ordered a crosspoint dxp 84 that I’m going to see if I can do this with. I tried enrolling with extron through my work we’ll see if I get approved since I support conference room equipment at work. I received my Extron DXP 84 Crosspoint yesterday. I was unable to get it on my network after resetting it. I also tried making a crossover cable and connecting it directly to my PC. I have ordered a USB to serial cable so I can turn on DHCP on the device. The manual of this model refers to 192.168.254.254 as the default IP of the switch so I don't think DHCP is on by default. My home Vlan is 192.168.1. * and I didn't want to mess up my home network so I'm going to wait for the usb to serial cable. I have a new (to me) Extron SMX, which is very close to your DXP (minus the ability to swap out input/output cards like my SMX can), and just like the 3x older analog Crosspoints I have, on each and every one of them I had to use the USB to serial programmer cable - plugging in via Ethernet cable wouldn't let me connect either. I think it's just how these are unless the previous owner happened to turn on that feature so the unit gets a proper IP address on your home network. To find the new IP address (once again hooked up via ethernet cable) I always go into my router's (in my case it's by Verizon and does wireless and hard-wired ethernet) default login IP address which is most commonly 192.168.1.1 (you'll need your router's username and password - sometimes written on a label on the router itself), then start looking at the IP addresses which are listed as being connected by ethernet until you find it, then once you find the correct address you'll see the Extron's built-in web interface and can go from there. Quickest way would be to change the IPv4 settings on your PC to static 192.168.254.10/255.255.255.0 with a gateway of 192.168.254.254, then try to hit the CrossPoint in your browser. If it doesn't work, or when you're done updating the switcher's network config, just switch back to DHCP. If you have a VM, you can change the VM's network settings and still be able to browse the web on your host PC. Probably a little more involved than what most people want to deal with; and, in any case, the USB serial cable will work regardless of network settings. My USB to Serial Cable arrives today along with a replacement Noctua Fan 60mm by 60mm by 25mm. I'll post a followup of what I discover. I made a video about doing this on the Extron DXP. I hope you enjoy. I just received my cable and was itching to go...but I can't install the Extron software. It errors out on install (Win 7 Ultimate 64bit). I've tried every mode of compatibility, and have run it as administrator. Any trick to getting this to install? Nice video - sorry I missed this when you initially posted. Good tip about just taking the URL address for switching presets - I'll have to see if that works on my Extron SMX - keeping my fingers crossed as the code on the HTML website to control it is a LOT more complicated than the Crosspoints are (and I haven't quite figured out how to do a web interface for the SMX quite yet because of that). I haven't run Windows 7 in quite some years, but it installed fine on my Windows 10 PC - did have some issues with it running with the version of .net framework (might have been Java?) or something like that (had to change the version of whatever that was). Ran fine first time off my Macbook Air running Windows 10 as well. I'll be damned--installed in Win 10 without issue. You'd think software made in the era of Win2000 would operate better on 7. Guess I'll have to lug my pc down to the extron to get this done. Thanks!